I feel like Ferris Bueller. It took a long, long time… but I've crossed this one off my bucket list. The ball, a foul into the lower level beyond first base, came into my hands with 2 outs and 2 strikes in the 9th inning off the bat of Todd Frazier, 3rd baseman for the Cincinnati Reds, August 5, 2011. The Cubs won, by the way. Thank you Dave for securing the tickets!! The foul lobbed overhead and careemed into the empty row right behind me. I dove, quite gracefully, bruised one of my ribs on my green metal chair, and scooped up the bouncing, rolling ball. Another guy who had run down the row chasing after the ball, muttered at me ("you got it") in a deflated offering of congratulations. I turned around, held up the ball, high-fived my amazing brother, and soaked in the sweet ivy. I feel like Ferris Bueller. Remember that incredible 1986 movie? 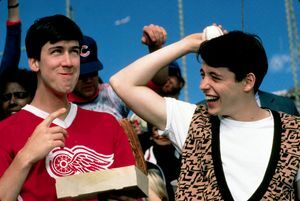 One of the best ever… Ferris skips school, lies to his parents and the high school administration, cheats, disguises, steals, gets his friend in trouble, worms his way through an amazing day, leads a parade through downtown Chicago and manages to catch a foul ball at Wrigley Field. And somehow, through it all, Ferris finds himself blessed and beloved. And yet, somehow, is it possible that I really could be credited as righteous? What did I do to deserve God's blessing (e.g. 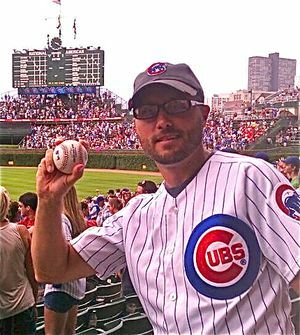 A foul ball at Wrigley that serves as a parable of God's showering of undeserved grace?)? That's the point. I did nothing. Exactly. In six verses (3-8) Paul uses forms of the word λογίζομαι five times. This word means "to credit" or "to reckon" or "to calculate/take into account". It is the first time in Romans that Paul has used this word… and he piles it on here. Paul's emphasis is important… This is a monetary term used to describe how someone comes to possess money. Typically, a person comes into money either because he/she earned that money as a wage or because he/she was given that money as a gift. So Paul said in verse 3 (TNIV): "Abraham believed God, and it was credited to him as righteousness." – Abraham could count righteousness as his because it was the reckoning for his belief in God. Belief in God = righteousness. verse 4 (TNIV): "Now to anyone who works, their wages are not credited to them as a gift, but as an obligation." – Payment due to services rendered can never be credited to someone as a gift. The IRS knows this. Revenue Canada knows this. If a person works, the one who receives the work is obliged to give payment. A wage is not a gift. Wage = not a gift. verse 5 (TNIV): "However, to anyone who does not work but trusts God who justifies the ungodly, their faith is credited as righteousness." - OK… God justifies the ungodly. In other words, people who are not like God, God (δικαιοῦντα) renders/declares/pronounces them right enough to be with God. Those who try to be godly by earning righteousness through their "work" will not receive such a credit in their eternal account. No work, but trust in God = righteousness. verse 6 (TNIV): "David says the same thing when he speaks of the blessedness of those to whom God credits righteousness apart from works:" – Paul is about to quote from the Psalms to show that what he says about the Gospel has always been true. And, don't forget, Paul has just brought Abraham into the conversation (verses 1-3… and again starting in verse 9). So Paul is setting up a defense from Scripture (Old Testament) to support his argument. In other words, Paul says, God has always credited people with righteousness unrelated to how "good" their "work" was. God's way in the Old Testament = same as now. verse 7-8 (TNIV): "Blessed are those whose transgressions are forgiven, whose sins are covered. Blessed are those whose sin the Lord will never count against them." – Paul quotes Psalm 32:1-2 here. The Psalmist is remembering that a person who has sinned has earned a wage (and not a good one! )… and so a person is blessed when God does not pay them according to their "work"… but credits them with a gift = forgiveness/covering of sins. In fact, God is willing to NOT credit punishment to someone as their wage… and God is willing credit righteousness to someone as a gift. Final Note: Thank you, Lord, so very much, for that foul ball. Although I wish it had been from the bat of a Cub and not a Red… but I won't complain.